Promote moist wound healing and reduce scarring with AmeriGel® Wound Dressing. 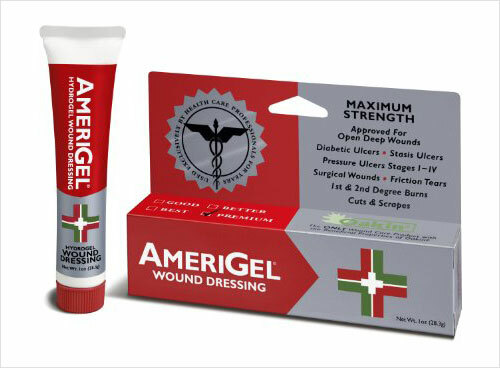 AmeriGel® Wound Dressing’s advanced formula promotes moist wound healing through its unique ability to address multiple wound concerns simultaneously. The hydrating base in the wound dressing provides necessary moisture to assist the body in creating an optimum wound healing environment. Zinc works together with the hydrating base to prevent scabs from forming, which can delay the healing process and lead to scarring. AmeriGel® Wound Dressing is indicated for cuts, scrapes, abrasions, pressure ulcers, diabetic skin ulcers, stasis ulcers, 1st and 2nd degree burns and post-surgical incisions. The Wound Dressing is approved by the American Podiatric Medical Association and has been rated the #1 topical wound/ulcer treatment by podiatric physicians since 2006. #1 Reated topical by physicians!